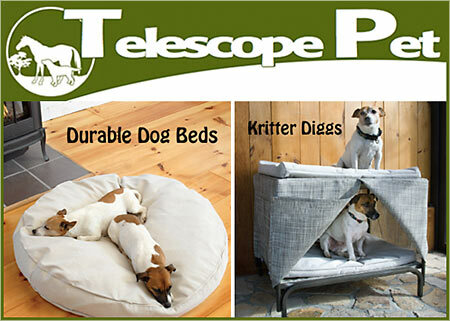 Soft Durable Dog Beds are perfect to put in your Kritter Digs to provide the ultimate experience for your pet! TelescopePet Products parent company, has more than 100 years experience manufacturing high quality outdoor patio and lawn, leisure furniture. We know fabrics and style! Our dog beds are designed and manufactured using incredibly durable, resilient, UV and weather friendly fabrics. Each dog bed has a breathable, inner core bag filled with shredded weather tough foam rubber, recycled and processed especially for our dog beds. Our beds are 100% weather safe. If they get wet, simply remove the inner bag and leave in the sun, or hang it to dry. The shredded foam is UV resistant. The outer covers are machine safe for repeat washing as needed. Each bed is assembled using the strongest and highest quality zippers available. These dog beds are totally safe for outdoor use but should not be left intentionally in the rain. If they get wet, dry and use. The Kritter Diggs is the best piece of real estate and dog or can put on their favorite humans wish list. The system is made from powder coated strong aluminum on an easily set up or collapsible frame. This makes it ideal for use at home or while traveling. This great system has two levels and two separate beds. The inner sanctuary, is 6”s off the ground keeping animals off of hot or cold surfaces and provides a safe cozy hide out for cats and up to, medium size dogs. It is shrouded with a weather proof durable mesh fabric that keeps sun and flies away from animals. Though pets are barely visible from the outside, they can easily see out and still be in tune with what’s going on around them. During winter and cooler times the mesh helps keep animals away from drafts and creates a cozier, warmer environment. The upper level provides the ultimate deck, lounging and sun bathing area where small dogs and cats will be sure to spend time soaking up the sun or just watching nature around them. The entire system is made from weather friendly products and components. It can be set up or folded in less than 2 minutes. All an animal needs is their favorite person to buy it and set it up for them. Set up it measures: 24”T x 25” deep x 29”Wide. Folded measurements are: 27” x 28” x 7” .